I think that's a good call, except I wouldn't use "break in oil". Conventional oil will seat in the rings. Break in oil is more suited for engines with flat tappet lifters. The C7 engine has roller tappet lifters. The other engine break in areas will lube just fine with conventional oil. The scuff of flat tappets VS the rollers makes this correct, but break in is still fine for just that, break in. Todays syn oils cannot offer the protection flat tappets of old need...zinc phos is a critical part of scuff protection. We use a good conventional on most roller engines, but a high zinc/phos break-in additive for flat tappets. We go a bit harder than that to ensure proper ring seat, but this is still a good guide.....and is written by the engineers!! Not marketing. MrFord and 2017z06 like this. So is the oil they are recommending(GM4718M) a synthetic? Of course you can, the idea that synthetic oil is any "slipperier" than conventional oil is urban myth. Exxon/Mobil dispelled the "break in oil" concept well over a decade ago in partnership with multiple major engine manufactures, get over the idea you need a special oil, those days are long gone. (the fact Honda adds extra molly to their new engines is irrelevant, no other manufacturer in the world does that and in fact, molybdenum actually DECREASES friction). To the 500 vs. 1500 mile question, initial break-in is in 2 steps, 500 miles for RPM restrictions and 1500 for racing or track use. It's similar to GM's break-in procedure for their trucks using the same Ecotech platform, 500 miles for RPM and 1500 miles for towing. The 1500 mile number is most likely more for the transmission and differential. Remember, it's a drivetrain break-in, not just the engine. Good advise! Forget the "drive it like you stole it", sounds good macho "flog it to it cries" break-in advise. Search for posts from people making claims on what to do. mjw930, and others, consistently provide sound, informed information...without the ego driven "I'm right because I have...baloney". Guys, how many have read the break-in instructions in the owners manual and compared it to the image posted above by Tuner Boost? After doing so, can you please point out to me where the significant differences are? For all practical purposes, the two sets of instructions seem very similar to me. One says run it up to 4000 RPMs. The other says don't go over 4000 RPMs. These are compatible instructions. One says the engine should be driven at varying loads and conditions. The other says avoid driving at any one constant speed. These are compatible instructions. One says that up to 500 miles drive normally and do not run the engine to its maximum speed, and do not expose the engine to extended periods of high load. The other says for 1500 miles do not participate in track events. These are compatible instructions. The only difference is one advises two or three WOT accelerations up to 4000 RPMs somewhere AFTER 30 miles and before 500 miles. The other says avoid full throttle starts for the first 500 miles. That is the ONLY significant difference. Can these be reconciled? I would venture to guess the "avoid full throttle starts" is for the transmission and differential, not the engine. So, somewhere after 30 miles and before 500, I will sprinkle in several WOT from about 2000 to 4000 RPMs, but in conditions where it does not jolt the transmission or differential (going down a hill, for example, or maybe from idle to 4000 do many WOT with the car in neutral). So, the instructions, for all practical purposes, do not conflict. Why is there all of this bank and forth banter of "No, don't do that! Do this!" when it is all pretty much saying the same things? Last edited by rdslon01; 09-05-2014 at 12:35 AM. smehat, greggshere, Tom0021 and 1 others like this. The significant difference is: The type of oil that is used for the break in process. Syn vs non syn. ​Red Car 2015 1LT Z51 coupe, #1284, torch red/black int. 8 sp auto, mag ride, red calipers, carbon flash badges, battery protection pkg. Believe it is their Syn blend. We always use a conventional oil for the first initial steps, and switch to a premium full syn at 500 miles. Huh? mjw has zero engine building experience going by what he has posted here, but I may be mistaken. What are you basing your comments on? 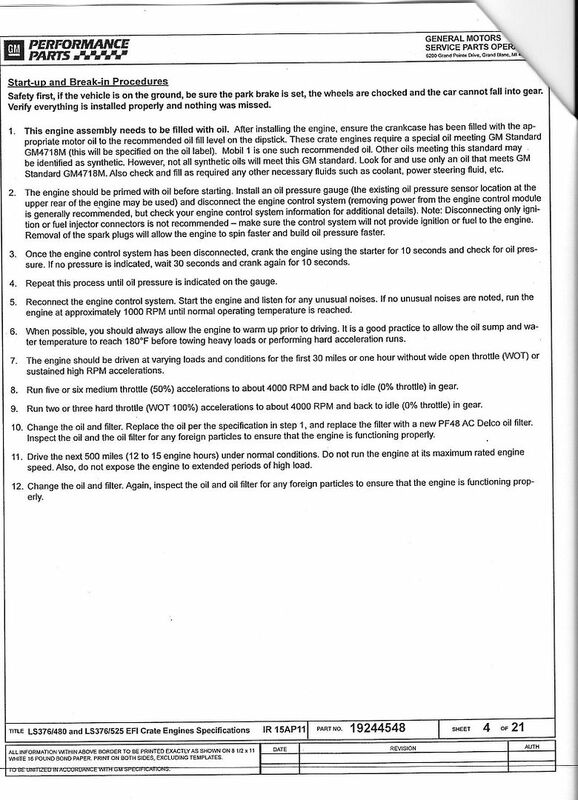 The break-in instruction posted above are from GM for passenger engine break-in...any engines from 4 cylinders to the corvette LT1 and all in between. And as rdslon correctly points out, the WOT part after 30 miles is for tech's (actual people trained by GM and other Auto makers and skilled independent auto techs. I did not make up or fabricate these instructions. This just demonstrates the difference between the "un-educated" buying public in general VS skilled, experienced automotive techs. And my life time for race engine building and racing professionally only add to the knowledge base. Remember, I started as a GM factory trained tech in 1974, and have never taken much of break from then until now and have always kept up with the latest technology direct from GM and the aftermarket industry. But share with us your qualifications. You may enlighten us even more. No matter how many engines we work on, we still are open to learn as the point a person "knows it all" is the pint they become ignorant. And I hardly "know it all". I learn new things constantly and am always open to here from other experts with proper credentials and experience. But I also learned long ago that everyone seems to be an "expert" behind a keyboard. I take it you did not read GM's instructions? And the differences in racing engines and passenger car engines are really mainly in durability. We would hardly break in a racing engine because we did not have enough "time". A new LS3 is only $5-6k, our racing engines are $15-75k plus. We take NO short cuts on break in. The Championships, and more importantly our lives depend on every thing done correctly. So not having "time" to break them in correctly has no bearing on the discussion. Ring seating is accomplished by the abrasive cross hatch hone we do on every new engine (or rebuilding) and after app 400 miles, a hard glaze sets in and covers the cross hatch so NO further abrading can take place. The pictures I am showing are not from race engines, they are from GM engines we tear down with excess oil consumption issues and we see the same thing in nearly all of them. Plenty of cross hatch is visible, but the hard glaze has formed before the rings could seat to the shape of the cylinder wall. When that happens then you will forever have excess blow-by and excess oil consumption. And that is why GM instructs us, as trained tech's, to after 30 miles do the 1/2 throttle, then full throttle runs. The only difference we do is run them to 5k RPM as these engines turn 6k plus, and we want to make sure we have covered the loading in both acceleration, and deceleration (engine braking) so the lubrication barrier is penetrated and the rings can abrade (wear) into the cylinder walls to form as exact of a seal as possible. Many do just fine taking it easy for 1500 miles, and have minimal oil consumption issues, but why chance it? The fix if the rings do not seat properly is what you see us doing constantly here...dropping these engines out and the invitation is open to all...come in and see in person these engines in various states of tear down and rebuild, and see all of this first hand. So many debates could be avoided by just looking past opinions and ego's, and come and see first hand (and no, the dealer rarely ever tears them down...they replace). Very wise and to the point. I don't think the ones that want drama and debates......but all the actual data is right there for those that truly do want to understand it instead of hurl "opinions" back and forth and take sides to fight. Every year we see the mainstream auto makers adopt many of the designs and principals they have learned from the race industry into production vehicles, hardly any car or light truck today comes with a "hot air" air box. Most all from tiny economy to 3/4 ton trucks all have true cold air intakes....and look back 10-15 years ago all the debate on the Corvette forums on CAI's being "snake oil", etc. Slotted and drilled rotors. Brake cooling ducts. Super charging and turbo charging....competition exhaust mode, and on and on. Just like the oil ingestion issues. GM and all others claimed there was no issue since the LS engine was introduced, yet one of the key "new" features of the LS1 DI engine was "Improved oil separating baffle systems in the valve covers and valley cover to help reduce oil consumption and related issues" Huh???? Say what? But the public in general does not pay attention to these things so most are like "great!" when GM for years claimed there was no issue. Also excellent post. Use non-syn in the break-in period and you most likely will not have an issue driving easy druing break-in. We just choose to make sure it breaks in right. Someone please close this thread unless these "experts" step up to the plate and warranty your car if you follow their procedures. Or at least put a disclaimer on this thread saying, "Following these procedures could possibly void your factory warranty." Chuck Norris is what Willis is talking about. How rude........are you stating that following GM's actual detailed instructions for proper break-in (that they provide us as Tech's) will somehow affect your warranty? Can you at least post your qualifications and credentials that qualify you to make such an outrageous post? Most of us sharing this accurate information ARE actual experts....factory train by GM and far beyond that. How about some intelligent dialog instead of acting like Putin or other communist leaders that silence any that dont agree with their propaganda. Just list your qualifications and certifications & experience in these matters that qualify you to make such crazy statements. That would at least give you some credibility behind what you state instead of looking like a clueless bully. I think we have taken this thread about as far as it will go. Each individual will have to decide how they proceed with how they approach the issue. This thread is locked. muzzyc7 and virosu like this. This video does a nice job of explaining new car break in. Enjoy! jsvette, elegant, Starfish and 1 others like this.